When I was a kid, going to Pizza Hut was a big deal. It was a place you went with the family for a big occasion, even if that occasion was just a Friday night. Nowadays, it’s more often fast food crap on par with frozen pizza. I thought that maybe it was just my standards changing as I got older. But no, Pizza Hut really has gone down the drain. In one of my earlier blog posts, I talked about a thing I called “brand decay,” where years of small cost-cutting measures turn a well-respected brand into crap. The example I used there was KFC substituting “honey sauce” for honey. It’s no coincidence that Pizza Hut is part of the same company. Of the five major restaurant chains that Yum Brands owns or has owned — KFC, Taco Bell, A&W, Long John Silvers and Pizza Hut — all have suffered from a spreadsheet-induced decline in quality. But of these five, Pizza Hut had fallen the farthest. Unlike the others, it started out as a sit-down restaurant before falling to the lowest tiers of cheap fast food. Pizza Hut’s decline has been uneven. Some restaurants are worse than others. Let’s start with the best and go from there. 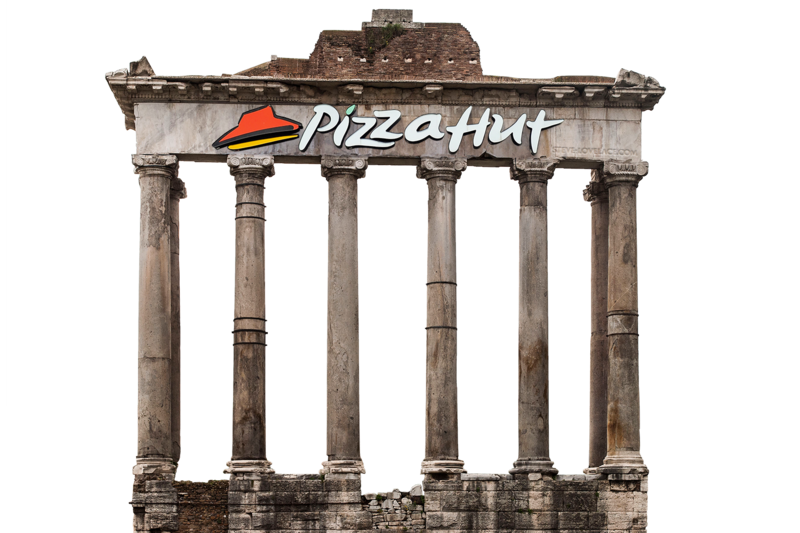 This was the only kind of Pizza Hut I knew as a kid. These free-standing locations have sit down dining, beer and a full salad bar. Here in Dallas, where the company is headquartered, the old Red Roof locations are extinct. But you can still find them in small towns. Inside you’ll find a blast from the past, with a restaurant that looks like it hasn’t changed in 30 years. I don’t know if it’s just the atmosphere, but these Pizza Huts still taste like they did when I was a kid. When it comes to the Red Roof locations, the oldest locations taste the best. Here in Dallas, most Pizza Hut locations are little strip mall storefronts. These locations are pretty much the same as Domino’s or Papa John’s, with just a kitchen and a cash register inside. I’m not a fan of any of these three chains, but given the choice, I’d rather have Domino’s or Papa John’s. It’s fast food pizza any way you slice it, but at least the other two don’t remind me of how far the quality of the pizza has fallen. The worst Pizza Hut locations are the ones that are inside another restaurant. These include both the combination Taco Bell Pizza Huts as well as the Pizza Hut Express locations inside of Target and other retail locations. You can tell these locations by their lack of choice. 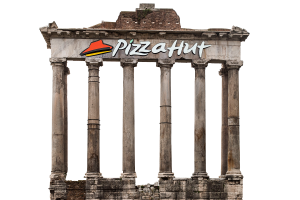 They usually only sell breadsticks and personal pan pizzas. They don’t offer custom toppings, because they pizzas aren’t made on site. It’s literally just a clerk, an oven, and some frozen pizzas. I’m sure there are plenty of people who still like to eat this (frozen pizza is still pizza), but I’d just as soon buy my own frozen pizza and heat it at home. Branding is an art as much as it is a science. A company with a strong brand uses graphic design, marketing, and customer service to form a relationship with its customers. As corny as it sounds, it’s true. When you see people with Apple stickers on their back windshields, it signifies that they have formed a relationship with an otherwise nameless and faceless conglomerate. The experience that I (and countless others) had with Pizza Hut back in the day make it painful to see how far the brand has fallen. This is a good reminder that the bottom line isn’t always the most important thing in the long term. Did you eat at Pizza Hut back in the day? If so, what did you think of it then, and what do you think of it now? Let me know your thoughts in the comment section. The main issue with Pizza Hut is the pizza itself. It gets just a little bit cold and it starts tasting like the box. This is doubly upsetting when you’re inside the building and there is no box. It also gets a distinctly non-pizza smell to it when it cools. Kinda that odd smell you get at a landfill where everything sort of mixes together. When I was a kid, it wasn’t like that and I can almost guarantee it’s the additives they put in the pizza bread itself either thinking to make it last longer or just to replace better ingredients with something cheap. Go buy a Pizza Hut pizza and let it cool down. Notice the smell and then take a bite. See if what I said isn’t true and it doesn’t take a genius to figure this out. That smell I mentioned, it doesn’t exactly stink. It’s just an odd, somewhat chemical-like smell that if you’ve been to a landfill you’ll recognize almost immediately. Now, if you are eating a slice of pizza that tastes like the box and smells like a landfill… I don’t care how cheap they make it trying to save the company, I’m not eating it as the taste and the smell make it almost abhorrent. Little Caesars is the cheapest and while I can’t call it the best, it retains it’s taste a lot better and, like the Blu Emu commercial says, it doesn’t stink.